Restore >> Library >> "The Clock of Time" .. The Clock of Time magazine takes a brief look at a few significant Bible prophecies that have been fulfilled since the 19th century and at some of the events of modern times that indicate other Bible prophecies are being fulfilled. While someone who is exposed to the daily news won't be surprised, the publishers hope that the trends of our times might be seen in the context of Bible warnings. To download this magazine as a PDF file (905 KB), click here. P.S. If you need a free PDF reader, you can download Adobe Reader here. 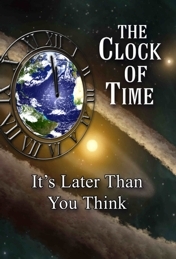 Note: The "The Clock of Time" magazine in printed form is 16 pages, approx. 5.8" x 8.5".